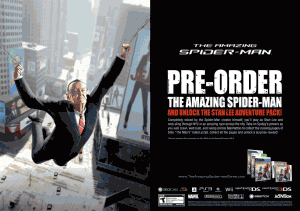 If you pre-order the new The Amazing Spider-Man video game from Amazon, you get a special bonus level where you play as Stan Lee. With superpowers, ‘natch. How neat is that? Sometimes I feel like I should change the name of my site to Geek Gold Card and just write about geeky stuff. This is one of those times. Superhero video games are a mixed bag, but I’ve had above average experiences playing Spider-Man games. The games based on the first two Tobey Maguire movies were pretty good, and Spider-Man Shattered Dimensions, which features multiple versions of Spidey, each voiced by a different actor who played him on TV (including Neal Patrick Harris), is great fun. It even features Stan Lee as a narrator. As far as I know, The Amazing Spider-Man video game is the first time gamers can actually play AS Stan the Man. But only if you pre-order from Amazon.